Watch the Aaronia Drone Detection System in Action! Find here our latest product: The RF Drone or Radar Detection System. 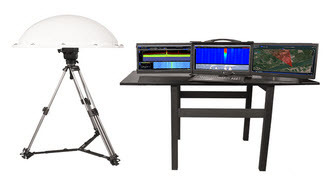 It is based on the Aaronia IsoLOG 3D Tracking Array Antenna, a rugged or remote-controllable Spectran V5 Real-time Spectrum Analyzer and a new Software Plugin for the RTSA Suite Software. All parts work perfectly together and allow a 24/7 monitoring and recording (full gapless data-streaming with up to 4TB/day). Each Sector/Antenna gets its own real-time view and is based on RF and µW detection. All views are combined to a 360° view including a 360° picture or 360° live video of the surrounding area/landscape. This gives full control over any RF emissions happening around. The system can provide an optical or audio alert if critical values are exceeded. Collect data and compare them to find out irregularities. The Drone Detection System saves considerable measurement time and allows very detailed information on the spreading patterns of drone emissions. The solution is compact, flexible and can be set up at any place you need to control. It can be used as a "single-spot" version, which is directly available. Or it´s possible to combine several systems in order to monitor larger areas, governmental offices, military base camps, industrial areas etc.. Protect your privacy and make sure of your physical security. Drones can be more than just an annoyance. The rapid proliferation of micro/mini UAVs is a growing potential threat to national and commercial security. Easy to make, cheap to buy, simple to fly, and hard to detect, commercially available drones are one of the most quickly evolving technological threats to military and civilian interests. 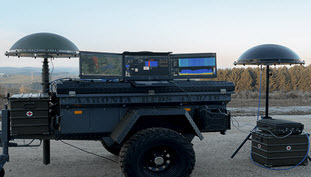 - Works also against drones "disguised" between buildings, industrial plants, trees..
- Made in Germany: The Drone Detection System is developed, individually produced and calibrated in Germany. This guarantees highest standards.